These hands-on weather lessons have taught my children about the interaction between the sun, water, and air. 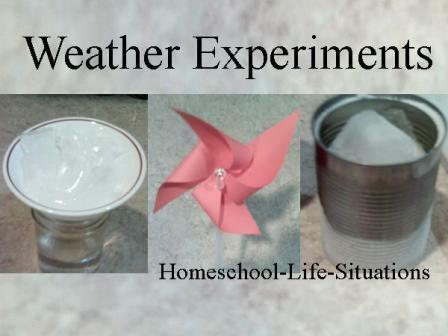 Your child will learn about the water cycle, wind, and fronts. They will also learn something about how a meteorologist determines the forecast. During warm sunny days water is heated until it becomes vapor and evaporates into the atmosphere. Cold air causes the water to condense into clouds. The clouds become heavy and the water falls to the ground as rain or snow. Some of the water soaks into the ground and is used by plants. Other water drops find its way back to rivers, lakes, and the ocean. The process starts over again. The science observations below can teach your child about the different parts of the water cycle. Place a plate with a teaspoon of water in a sunny window. After some time the plate should be dry. Most of us have observed condensation happening. Find a dry drinking glass. Place ice into the glass. Make sure that the outside of the glass is dry. When the ice starts to melt you should observe water on the outside of the glass. Learn about frost with this simple weather lesson. 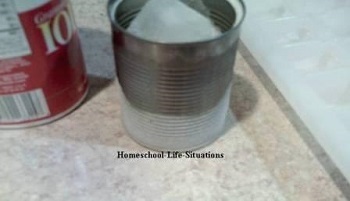 Place a layer of salt in a metal can. I used a clean soup can. Add a layer of ice to the salt. Fill the can with the salt and ice layers. The top layer should be salt. When the ice melts frost should form on the outside of the can. Did you know that you can make it rain inside a jar? From the explanation above you know that warm air rises. It will come into contact with colder air causing the water to condense. When the water droplets become large enough they will fall to the ground. To show this process I used a pint canning jar. I boiled some water. I had a small bowl of twelve ice cubes. 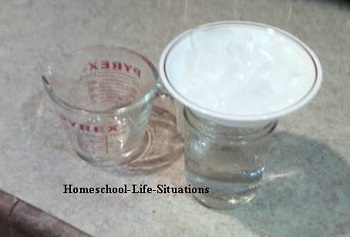 I place one cup of boiling water in the canning jar. I then quickly placed the bowl of ice on top. The inside of the jar got cloudy. Every so often the water would move like rain hitting a mud puddle. We have also studies about different cloud formations. We were able to identify the feathery cirrus clouds that are prevalent during summer. Stratus rain clouds were also easy for us to identify. When a warm and cold air mass meets it causes a weather change. The area where the air meets is called a front. Warm air is lighter than cold air. When a warm from comes into contact with cold air it moves over the cold air. The moister in the air condenses making clouds and rain. If cold air moves into a warm front it can cause thunderclouds. Warm air rises. Cold are moves in to take the warm air's place. Air is always moving. You can sometimes see warm air moving. I have seen heat waves rising from hot sand or back pavement in the summer. A simple way to show wind is to make a windmill. You will need a four inch square of paper. I used colored printer paper, scissors, a push pin, and a straw. Learning about storms can also be apart of our weather lessons. A tornado is a fast moving funnel of air. They happen usually in dry areas. When I was in college another student did a demonstration on making a tornado. Fill a clear 2 liter bottle about half full with water. Add balls made out of aluminum foil. Flatten the balls enough that they do not float. Tightly screw the cap onto the bottle. Move the bottle in a circular motion. You should see a small tornado. A hurricane is a tropical storm that starts over the Atlantic Ocean. It can have winds of 74 miles an hour or greater. Besides high winds there is usually rain, thunder, and lightning. The storm can also be referred as tropical cyclones. If they happen in the western Pacific they care called a typhoon. Lightning is static electricity that builds up in a storm cloud or between a cloud and the ground. You can also produce static electricity. I remember doing this as a child. I would walk across a rug scuffing my shoes. When I touched a door knob I would get a shock. If I had been in a dark room I should have seen a spark. I have read that you can rub your cat briskly to produce static electricity. We tried and we could not do it. Maybe the day was not dry enough. We also talked about what type of clothing we should wear when we went outside. When my children were older we graphed the temperature. What kinds of clouds are present? Record your findings in a notebook. If you have access to a barometer, record the air pressure. From your findings you can make a prediction. Then check your prediction with what meteorologist has said will happen. If your predictions are wrong remember that meteorologists have more instruments. They can measure wind speed with an anemometer and a hygrometer to measure humidity. Today they also have satellites and Doppler radar. Hopefully your children will learn about the weather with these simple lessons. I know that my children have.